You will need an LED compatible flasher unit to flash LED bulbs. 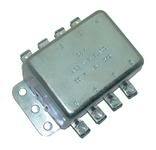 They are not load sensitive unlike standard flasher units. Choose from types available below. Price reduction on some flasher units (part No. 2) now £6.00 each plus VAT. The Ultimate LED Flasher Unit! Easy to fit. 2 or 3 terminal in one unit. 3rd terminal powers a dashboard tell tale - Leave open if not required. Flying lead must be connected to earth. Will flash LEDs or a mix of LED and filament bulbs at the legal flash rate. Suitable for hazzard warning lights. Connection instructions are on the box for easy reference. Use in new installations or to replace original units. Easy to fit. 2 or 3 terminal. 12v negative earth. Both types of three terminal have live in, flashing out and earth, the only difference is the terminal configuration. No more leaving your indicators on after a turn! 1. You've fitted LED indicator bulbs and a 2 pin flasher unit to your car or motorcycle. Everything worked fine with the original bulbs but now when you put the indicators on they all flash like hazard warning lights. This is because the new LED bulbs require so little current that the tell-tale bulb passes enough to flash all indicators at once. Same as part number 4 but including a Durite green tell-tale light. An electronic copy of the Lucas DB10 relay that looks just like the original. Use with our amber/white sidelight/flasher bulbs and gain hidden indicators for that original look. 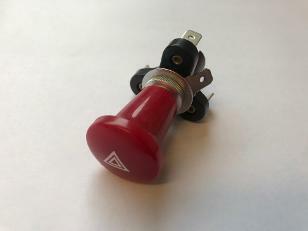 High quality period looking indicator switches. Column mount types have Bakelite base with illuminated or non illuminated end. Adjustable strap fits around any steering column. Panel mount type has no tell tale and requires a 25mm diameter mounting hole. Simple to fit. Suits 6v or 12v vehicles.